You can select the appropriate feng shui picture frames for photos and artwork when you follow the five elements theory. 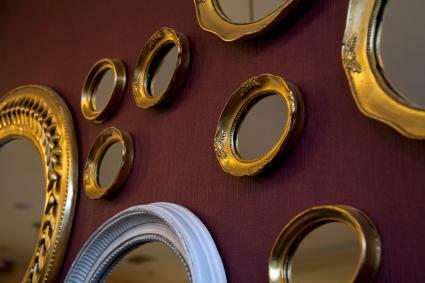 Choosing the best frames can add another layer of feng shui elements to your home sectors. One of the best kept open secrets about placing photos is to first place them in the appropriate frames. If you use a frame made of a destructive or weakening element it won't matter what other feng shui placement rules you follow since the frame will negate any auspicious energies desired. 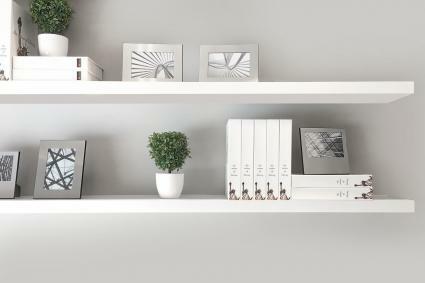 Select wood frames for all photos you wish to display in the east, southeast and south sectors of your home. You can use wood frames in a natural or stained finish as well as green (E, SE, and S) or red frames (south only). Choose black or blue frame colors when you want to symbolize the water element. Silver, gold, copper and white colored frames symbolize the metal element. Metal frames for a north sector photo display can be in any of these colors. Photo and artwork that is displayed in the southwest, northeast or center of your home can be placed in earth element frames. A ceramic frame is a perfect choice for the southwest, northeast and center sectors. A quartz or frame encrusted with crystals is a good choice for this sector. The optimum color choice for a ceramic photo frame is ocher. Any value ranging from pale yellow to a deep yellow is a great choice. You may prefer to select a medium to dark brown colored ceramic frame as a companion color to ocher. 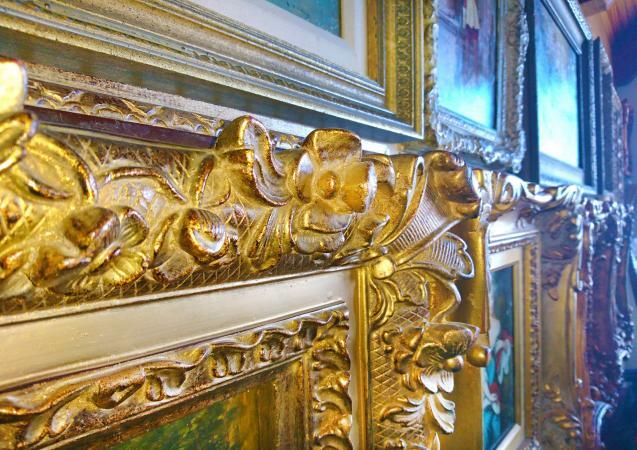 Photos and artwork displayed in the west and northwest sectors of your home are best placed in metal frames. Both directions are governed by the metal element. You can also use ceramic (earth element) frames in the west and northwest sectors since the earth element produces metal in the productive cycle. You can select the earth element color of ocher for ceramic or metal frames. 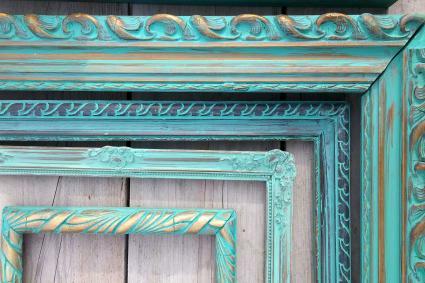 Choose metal colors for your frames, such as gold, silver, copper or white. When you know the best element for the material of the picture frame, you'll need to determine the frame style and how it will complement the photo or artwork. Create an overall balanced look by selecting an appropriate frame design and style for each photo and piece of artwork. Consider where you'll be hanging the picture and use a frame that fits in with your existing décor. You want the photo or artwork to flow naturally with your home décor. Consider the color(s) assigned to each sector and choose photos or artwork and picture frames that contain these colors to enhance and symbolize the auspicious chi energy attracted to the sector. Water: A lazy curving stream flowing into the room is a nice choice for a north sector room or north wall with a metal frame. Fire: A beautiful sunset is a beautiful addition to a south sector room or south wall in a wood frame. Wood: Select a forest scene for this element to add to the east, southeast and south sectors in a wood frame. Metal: Pick a subject matter that reflects the metal element, such as metal objects with a metal frame. Earth: A photo or picture depicting ceramics, pottery or crystals is a good choice to reinforce the earth element with a ceramic frame. If you want to get really creative, you can select a frame shape to correlate to the sector element. Water: Wavy lines or curved designs represent the water element. Fire: Triangles or star-shaped frames represent the fire element. Wood: Rectangle shapes represent the wood element. Metal: Oval or circle shapes represent the metal element. Earth: Square frames represent the earth element. There are a few things to keep in mind when selecting frames that you don't want to do. The metal element is like an ax and chops up the wood element. The fire element destroys metal in the destructive cycle. Avoid using metal frames in the NE, SW and center sectors since metal weakens the earth element governing these directions. You don't want wood frames in NE, SW or center sectors since wood destroys the earth element. There are five elements that you can use for the picture frame material. By using the sector assigned to the element, you can increase the existing element or activate it to attract auspicious chi energy.